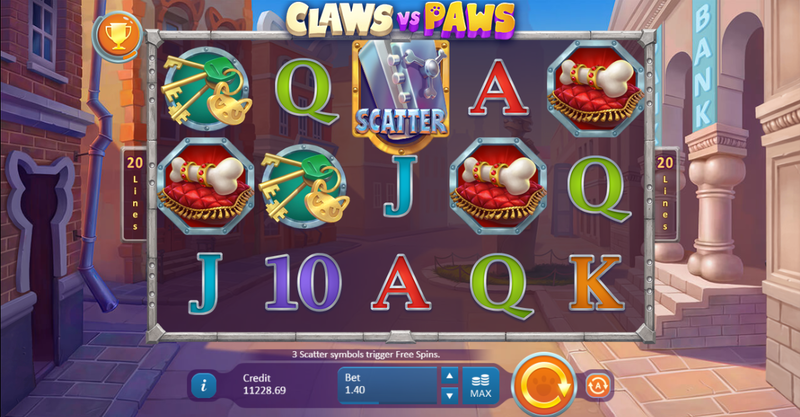 Claws vs Paws by Playson is a 5 reel and 20 payline slot with a dog vs cat theme. These two win you lots of prizes from the diverse features like 3 main game features that are randomly triggered, re-spins, free spin features, wilds, progressive multipliers and more. It's regarded as one of Playson’s best slots to date. Start your stakes from 20p to £100 a spin. You can visit the site here. Playson was formed in 2012 and is still regarded as a new company by most competitors. The company is continually expanding, proving that it's got what it takes to compete in the industry. This game has got well designed cartoon graphics. Claws vs Paws is based on a cat and dog. The previous is a hacker while the latter is a watch dog whose duty is to guard the bank from the sneaky cat. This slot has a classic cops vs robbers feel with symbols on the reels including playing card values K, Q, 10, A and J, a diamond, dog bones covered in diamonds, police hats, the Claws vs Paws logo and sets of keys. You can join & play today and discover our general Easy Slot promotion. The logo pays the highest value of 25x your bet when 5 land on a payline. Wild symbol -The diamond acts as the wild. It can substitute all the other symbols except the scatter. When 5 wilds land on a line, you'll win 30x your bet. Winning Streak Re-spins feature -This feature is activated randomly during the main game. You can win 2 to 4 winning re-spins. The cat lands on the reels, hacks the field and adds symbols that can form you a win. Top-Symbols Re-spins feature -This feature can be triggered randomly and get you 3 re-spins that feature high paying symbols only. All symbols hit the reels, but the dog clicks the button and eliminates all the low-value ones. Big Win Hacking feature -This one is activated randomly during the main game. The Cat replaces random symbols with wilds and gives you a big win combo. 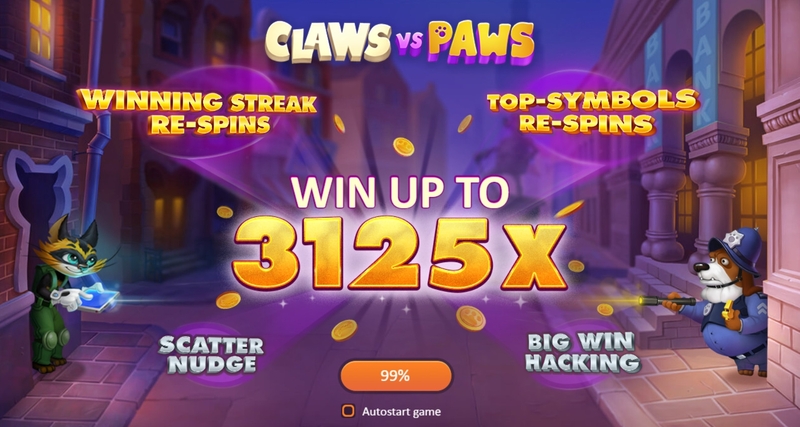 - Sliding Wild Free Spins feature – It's triggered when 2 vault scatters ( on the 1st and 3rd reels) and a cat bronze frame scatter (on the 5th reel) land simultaneously. On each free spin, a Sliding Wild can be randomly added onto the reels. Players can get up to 3 of them which then slide a position down on each spin. The free games go on as long as Sliding Wilds reach the bottom. -Progressive Multiplier Free Spins feature -This feature is triggered when 2 vault scatters & a cat silver frame scatter land on the reels (same positions as the other free spin feature). 2 special symbols - Decryptor and Alarm can also appear. The Decryptor raises the multiplier value by 1 while the Alarm reduces the multiplier by 1, while also switching on an Alarm light. You also get a multiplier value going up to 5x on each free spin and the free spins go on until all of the Alarm lights come on. You can play with a total of up to 30 free spins. -Sticky Wild Free Spins feature -This feature is activated when players land 2 normal scatters & the cat golden frame scatter. Spinners win 10 free spins & a certain number of sticky wilds that will be added to the reels on each spin. Watch the dog because sometimes he removes the sticky wilds. They can only stay in place for a given number of spins. Achievements feature -Tokens appear in the main game randomly and are then added to the counter. When you land a particular number of tokens, you get to spin the Prize Wheel. When you win a certain number of tokens, the prize wheel also upgrades.